You wouldn’t think a grown man, a man with three kids and 21 years of practicing law, would talk about his childhood bike like it was a Ferrari. But Brad Houston will extol the virtues of the 1966 Schwinn Stingray at length, from its banana seat and five gears to the butterfly handlebars and stick shift. “I remember riding that bike thinking I was the king of the world,” he says. An unexpected gift from his father when Brad was in fourth grade, the bike was cutting edge in its time, and a whopping $72. In today's world of $2,000 carbon frames, electronic shifting, and custom paint jobs, the Stringray might not seem quite as impressive. But when cycling becomes an integral part of a person's life as an adult, the memory of that first shiny cruiser stands out. Most Austin-area cyclists know of Brad Houston even if they've never met him face to face – in addition to running a law practice that specializes in helping injured cyclists, he sponsors eight local cycling teams and the Driveway Series, and is also the founder and organizer of Gruppo VOP, an informal cycling association currently in its twelfth year. Brad's no cat 1, however. In fact, he'll be the first to tell you he's not an elite racer. He simply enjoys riding, and his involvement in the cycling community arises partly from a sense of obligation, since nearly 80% of his clients are cyclists, but more importantly, from a love of the sport. Whether it was the childhood joyrides, college commute, experimentation with triathlon, influence of friends, or some combination of all his experiences on two wheels, for Brad Houston, cycling has never lost its shine. In a sport in which we so often celebrate and admire the elite riders who cross the finish line at the front of the pack, it's important to also recognize the contribution of the individuals who are its backbone and heart, turning what some people would call a "hobby" into an all-consuming lifestyle, in many cases giving back as much as they take from it. Few lawyers who specialize in cycling cases begin on that track. Brad started out in business, majoring in Petroleum Land Management and Real Estate at the University of Texas. His interest in law had been discouraged by his professors and mentors, who told him that since he wasn't planning on practicing law, then law school wouldn't be a wise investment. So when he decided to go to the California Western School of Law in 1987, six years out of college, it was a departure from all the advice he'd been given. Brad's turning point was a triathlon gone wrong – he'd been competing in tris for three years, and hoped to qualify for the 1986 national triathlon championships at a regional event in Houston. The swim buoys on the course hadn't been weighted down properly, however, and with the strong winds and ocean currents, what was supposed to be a 1.2-mile swim turned into a 2-mile swim. Swimming was his weakest event, and Brad missed qualifying by several places. "I was so angry that I'd spent that whole season training and getting ready," Brad says. "I'd been thinking about going to law school for eight years. I knew that if I put as much effort into law I was going to have a better return on my time. So I decided that day after the race, at the race site, that's it, I'm going to law school." Despite his original intent to return to land management and real estate after graduating, during the three-year law program he soon found himself on the "conveyor belt" at a big firm. "It was really interesting, but I just knew it was no way to live, billing hours and keeping track of every six minutes of your life," he says. "Funny, I look back at the lawyers back then who were in their mid-50s. Most were overweight and looked like they had hypertension, like they were about to have a heart attack, and they were on their second marriages and were talking about how they liked their partners better than their wives. So I kind of developed an exit strategy." 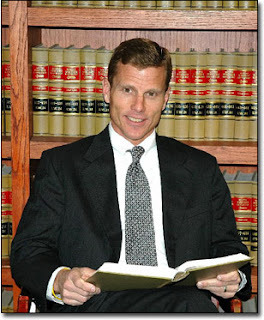 Now 53 years old, Brad has worked in many areas of law. In addition to real estate and commercial litigation, he has served as assistant county attorney and assistant district attorney for Travis County. In 1996, he opened his own personal injury practice, and there, he says, is where he found his true calling. That year, Brad took his first cycling case, representing a client who was an expert mountain biker. On a training ride, the cyclist had gotten into a road rage situation with a delivery truck driver. The two were stopped at a traffic light, and when the cyclist rode ahead, the driver intentionally clipped him with the truck's side view mirror. The cyclist managed to stay upright, but was badly bruised, later discovering he'd also sprained his back. He had passed a police officer prior to the incident, so rode back and reported the crime, then biked himself to the ER. The employer of the truck driver, a national grocery store chain, refused to pay the cyclist's hospital bills, and the case went to trial. The jury voted in the cyclist's favor, and a judgment was granted against the employer. Brad says that he'd like to claim it was his brilliant lawyering that did the trick, but admits it didn't hurt that the mountain bike racer had the look and demeanor of Steve McQueen. "It wasn't a big judgment but it was vindication for him," Brad says. "He goes and tells the biking community that Brad Houston is Perry Mason." Brad now focuses almost exclusively on cycling cases, representing competitive cyclists, recreational cyclists, triathletes, and bike commuters. The majority of cases are settled out of court, he says, though they vary widely in scope. For the most part, he takes only serious injury cases, but offers a free 1-2 hour consultation to help those with simpler cases navigate the claims process. He also plans to create a step-by-step information packet for certain types of cases that don't require full legal representation but are still very complex – for example, accidents that involve property damage and contusions but no broken bones. Brad says he has never regretted the decision to concentrate on representing cyclists. "I've become friends with almost all of my clients and I get to talk about cycling with them, about their bikes and components... It's just so much more fun than most law jobs. And the thing that really makes it good for me is what makes anybody's job good for them – it's satisfying. I get a lot of satisfaction taking someone who's vulnerable, someone who doesn't know the claims process or the legal process, and representing them to make sure they don't get taken advantage of by an insurance company." "A lot of my clients have really, really bad things happen to them. My job is to minimize the financial impact, and as best as I can, try to make a positive out of it. They shouldn't be in debt because of somebody else's mistake." Gruppo VOP predates email. In 1999, Brad started filling up a business card in tiny print with the names and numbers of cyclists who were interested in weekend rides. He would call them the night before and say when and where the ride was starting. With a little time and the advent of email, the rides' popularity grew. At one point, 340 people had requested to be on the email list. In an attempt to stave off the spam filters, Brad was sending out batches of emails, and relaying the details of a single ride would take him as much as half an hour. Rides now start five times a week from the end of Brad's driveway, most well attended. He says Gruppo VOP has been one of his favorite hobbies for the past 12 years. He credits its success to two factors: The first, that he's a tough taskmaster. The latest a VOP ride will start is 3-4 minutes behind schedule. And the second, that the ride is completely inclusive. Gruppo VOP is not a competitive team, but a training group. Brad says that is what has made the group unique, the fact that many different teams can ride together and feel welcome. "We have riders from Team Brain and Spine, Joe's Pro Bikes from San Antonio, Austinbikes, Austin Nationals, Wooly Mammoth... VOP is so non-exclusive that you become a member even if you don't want to become a member, and you can never quit," he says. 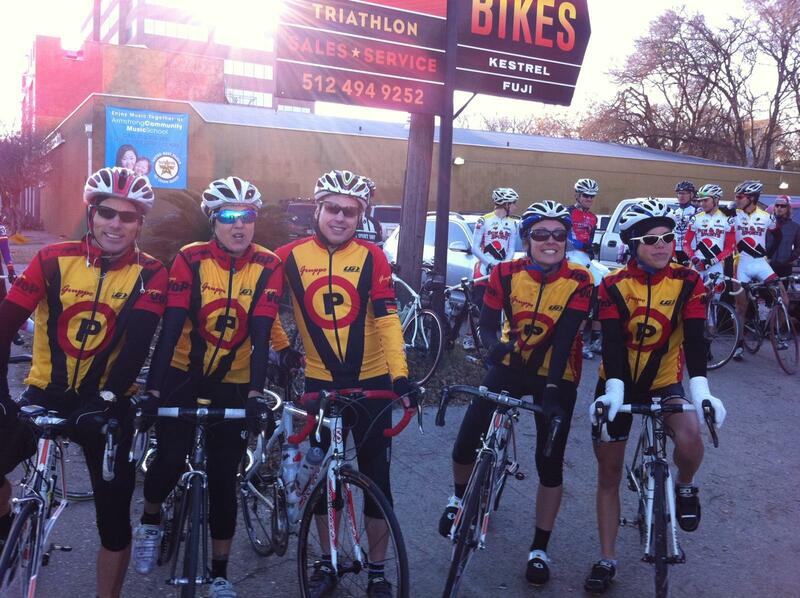 "All you have to do is ride with us once to be a member, and there are never any dues or assessments." Brad also sponsors eight competitive teams, which currently include Violet Crown (the team for which he races), Austin Flyers, Austin Nationals, Wooly Mammoth, UT Cycling, Team Brain & Spine, Super Squadra, and Snapple-ATC Racing. Sponsoring local teams wasn't exactly a business decision, Brad says, though some clients might prefer a lawyer who shares their passion for the sport. 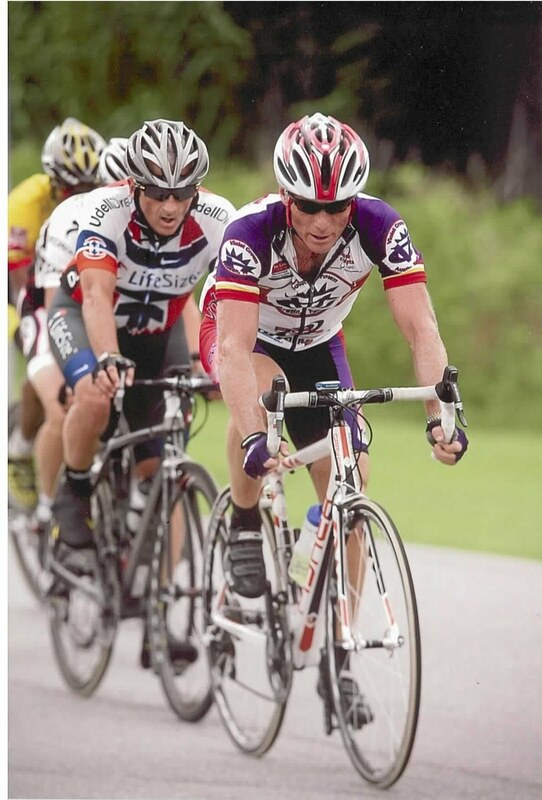 Competitive cycling is a niche group, and with many of the teams he's sponsored, he's had no direct connection with his law practice, no referrals or related cases. The first team he sponsored, roughly five or six years ago, was a women's team. "Team Joy Ride" later became the Austin Flyers. "I've got two daughters, my Mom's kind of a women's libber, and my wife came up through Title IX and was a trailblazer in girls' high school sports in the 70s. I felt I needed to support women's sports." The other sponsorships, naturally, seemed to follow. 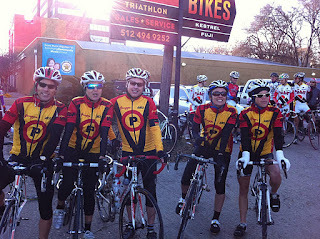 Team Brain and Spine, Super Squadra, and Snapple-ATC Racing are new additions for 2012. "My kids may not go on vacation this year," Brad says, laughing. You might wonder if sponsoring so many competitive teams might offend different factions. When it comes to the world of bike racing, is it possible to have your finger in too many pies? Well, when you're the Perry Mason of cycling, perhaps not. To join Gruppo VOP on a training ride, visit Brad's website for details – contact him by email or ask around for current times, as they change by season. Until daylight savings ends, the weekday rides start at 6:45am, the Saturday ride starts at 7:30am, and the Sunday ride starts at 8am. 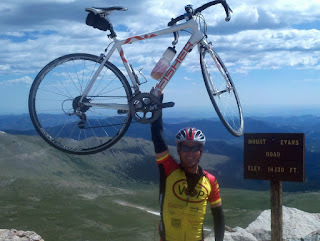 For an overview of issues affecting cyclists, check out Brad's 2011 "Laws of the Street" article. 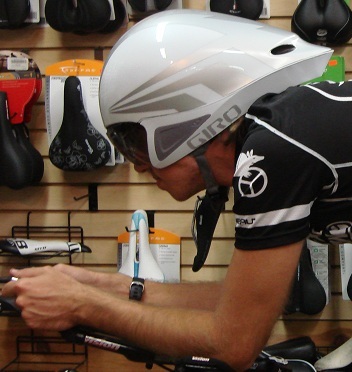 After increasing training volume and quality and improving your position on the bike, an aero helmet is the next best bang for your buck. Their teardrop shapes and reduced vents lessen drag as wind pounds into your head and over your back. Even when you tilt your head down and point the long tail of an aero helmet straight up, you are still producing less drag than a road helmet. There isn't much of a downside apart from looking a bit strange. Just put one on and save around 30 seconds per 40k. Simple! But which helmet is best? Well that depends, as usual. Austin Tri-Cyclist takes a look at four models we carry and breaks them down for you. Even better – to celebrate the 2011 Longhorn 70.3 race all in-stock aero helmets are on sale 20% off list price for race weekend! 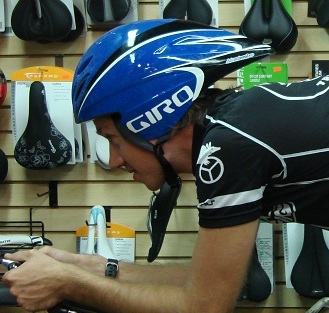 The most important consideration in choosing an aero helmet is how well it fits your body and position. You want a helmet whose tail fits closely against your back, and one that is no larger than it needs to be. Pick the smallest size that fits you comfortably, and spend a moment to determine how well it fits against your back. Customers are welcome to set their own bikes up in our fitting center and see how different helmets look on video. Visors can improve aerodynamics, but many riders prefer to use their own sunglasses. All of the helmets in this review allow you to remove the visor if you don't want it. Ventilation can also be a big concern for some in the Texas heat. Vents will reduce the aerodynamic advantage of a helmet, but if you don't want them, you can always put some packing tape over the vents for cooler days or for shorter events. None of these helmets differ in their weight enough to be a performance concern, but less weight could be a comfort advantage for some riders. 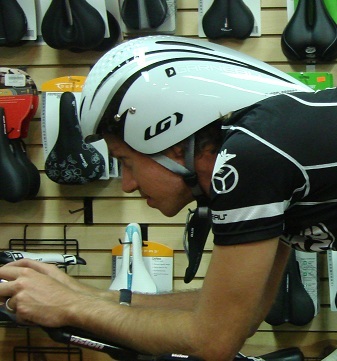 The top-of-the-line aero helmet from LG is the most distinctive-looking option. They seem to have thrown every aero geek idea in the book at this helmet: dimples on the front, vortex generators in the middle, and a Trek Speed Concept style truncated airfoil on the rear. LG claims that all of these features reduce drag, and that this has been tested in the wind tunnel, though actual data has not been made public. The truncated shape on the back of the helmet may prove advantageous to riders who do not hold their head very still, or tend to look down much of the time while racing. We found this helmet to be easy to put on and adjust. It was one of the heavier helmets in the comparison, but only by a few grams. A UV protective visor is included in the price but may be removed if preferred. The word "superleggera" is Italian for "superlight" and this helmet does not disappoint on that front, coming in as the lightest helmet in the comparison. These weight savings are not likely to win you any races, but they may keep your neck more comfortable if you struggle with that issue. Dimples are still featured on the front, as well as a few vents. Otherwise the shape is more conventional. The Superleggera is a solid helmet that is also easy to put on and adjust. A visor is not included but may be purchased separately. This helmet is the most expensive and seemed to be the most complex, as well. The adjustment mechanisms are extensive but not simple. The helmet covers much more of your face and ears than others, and wraps very tightly against it. The helmet can take a while to put on, and may not be the ideal choice for triathletes looking to get out of T1 as fast as possible. Time trialists should give it a serious look, though, as it probably has the best aerodynamic pedigree of the bunch. Another interesting feature is the bottom of this helmet can snap off and be replaced with a lower profile one, allowing you to customize the fit of the helmet against your back. This helmet is currently the helmet used by pro team Garmin Cervelo, Tour de France TTT champs, who take their time trialing very seriously. A visor is included with this helmet. This helmet is the simplest and most affordable helmet in our comparison, but is still a wind tunnel tested product that has been worn by TT champs such as Dave Zabriske. 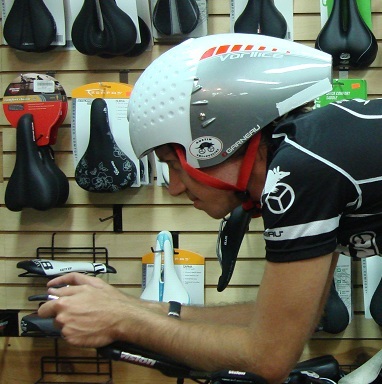 This helmet was a breeze to put on and adjust and should work well for triathletes. There is no mechanism for a visor to be installed so sunglasses are not optional. If you prefer wearing your own eyewear anyway, save some money and give this helmet a try. 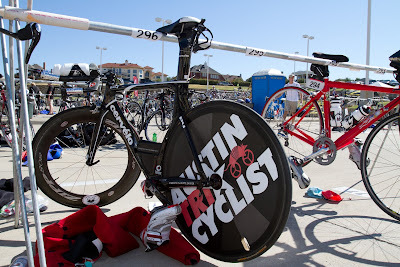 This past weekend was the final race of the Lifetime Fitness series in Dallas. Race morning was surprisingly cold for a Texas triathlon but warmed up by T1 when the sun came out, and it was perfect weather the rest of the day. The swim was an in-water start. Previous years was a diving start off the boat dock, but low water levels this year discouraged a head-first entry. The course was an out, across, and back counterclockwise wetsuit swim and mostly smooth except for some choppy water between the 1st and 2nd turn. 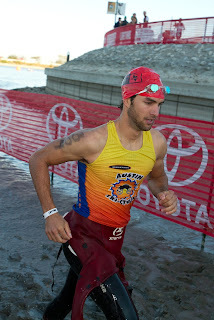 The last 50 meters was knee-deep mud and waist-deep water, making it tough to swim or run through. The swim-out led athletes around the Hilton on the Harbor and into the parking lot transition. The bike-out was a short but steep hill right out of the gate to get to the street. The bike course was a cut-and-dry lollipop loop with just enough wind to play mind games with you, but had PR potential and ended with a fast downhill mile. Once in and out of T2, the course went out the same T1 hill and leveled out but remained uphill for the first 1.5 miles. The last ~1.5 miles to the turnaround were mostly flat. After the turnaround it was a guaranteed negative split with the long downhill finish. The finish line chute wrapped around the hotel, promising a tunnel of cheering spectators. 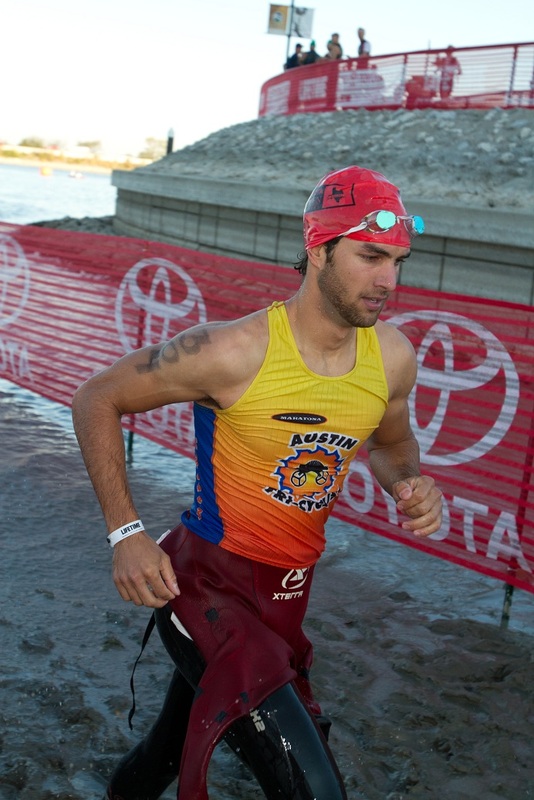 Cold water, tables of food, and Andy Potts welcomed finishing athletes. Another must-do race (driving distance from Austin) in the books, and a comparatively fast course to end the season with satisfaction.